What Do Young Strawberry Plants Look Like? Q: What Do Young Strawberry Plants Look Like? I have a few strawberry plants that have sent out some runners but the new plants don’t look much like the mothers? is this normal? should I remove the new plants? will they look more “normal” later? 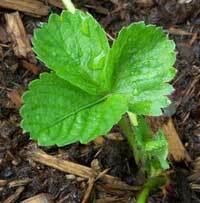 Answer to: What Do Young Strawberry Plants Look Like? Thanks for stopping by Strawberry Plants .org! It is fairly common for young runner plants to look different from the mother plants at any given age. Often, the leaves will be a lighter green and will look more “jagged” than the older, more mature leaves on the mother plant. However, the runner plants are exactly the same as the mother plants genetically. Because of this, if you let them grow, they will carry the same genetic material and manifest all the same traits as the mother plants (and will eventually look almost identical). Remember, the mother plants usually have a good bit of growing done ahead of the clone plants. Because of this, the clone plants will look like the mother plants used to look when they were that age, and the mother plants will look like the clone plants are going to look when they get to be that age. So, to be more direct: yes, slight appearance variation is normal, and they will look more “normal” later on. As to whether or not you should transplant them, that depends. 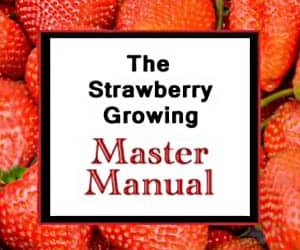 You can read the page on Transplanting Strawberries for help there! I have planted strawberries seeds from the fruit i bought at the grocery store. I planted it straight into the dirt and watered the ground for a bout a month. I noticed that my “strawberry’s leaves” were the two cliche, simple leaves. I don’t think these are strawberries. What do you think? Unfortunately, No. It is an imposter! Good luck! i planted strawberry plants in april in surprise AZ when will strawberry s actually grow. It depends on how old the plants you purchased are and what variety/type they are. If they are June-bearing, you should pinch the flowers off, and you will get a full harvest next year. If they are everbearing or day-neutral, you should get a smattering of berries by the end of the season. If they are new plants or were dormant bare root plants when you received them, you will again likely have to wait until next year. Good luck! Approximately 10 days ago I planted some strawberry plants that I purchased from a local Home Depot. After planting, I mulched with some straw and have kept the plants watered. Yesterday I noticed some green sprouts protuding thru the mulch but they look more like large grass sprouts and do not appear to be coming from the strawberry crowns. Do I have strawberries growing or grass from the mulch? I do not see anything coming from the crown. You’ve got weeds! Go ahead and pull out the shoots.